First and foremost, let me ensure you that in no way is this article going to be critical of Steven Seagal’s (Taka Sensei) aikido technique. The man is a highly accomplished aikidoka (holding a 7th degree black belt in aikikai). What the article hopes to identify is his subtle stylistic advantages, and components of his skill set which make him a particularly unique and identifiable study in the art of peace. So, What Makes Steven Seagal’s Aikido So Unique? #1 Physical Size: Regarding physique, it is important to recognize that Taka Sensei has extreme height, reach, and hand size advantages over most of his attackers. Height & Reach: Taka Sensei is 6’4.” His typical Japanese uke (like the one in the picture to the left) is 5’5” - 5’7”. In the literal sense, Taka Sensei is nearly a full foot taller and also has a significant reach advantage over his typical uke. This size advantage means that he is able to engage uke much earlier than uke is able to engage him. In many ways his attacker appears to come at him in the same way an angry child might approach a much older sibling or parent. Of course this height advantage, and the associated reach advantage that comes with it, also serves as a technique amplifier. Consider the Pull Down from the Rear Classical Technique. Now ask yourself, “How much more lead could you generate if your lead arm was 6 inches longer, and you were a foot taller than your attacker?” That additional reach and size advantage ~ which translates into and even greater “ability to lead uke” (generating even more power from already impeccable technique) ~ is another characteristic which separates him from us, and adds to his unique skill set. #2 Posture: The man stands bolt upright with a slightly forward lean to his hamni stance. He also has a tendency to keep his hands down by his sides (in some way, baiting uke into a more confident attack), and he then raises his hands quickly when the attack comes. #3 Blocking & Entering Style: He often uses a Wing Chun Block ~ which has its origins in Kung Fu. This 2 handed block or parry combined with his consistent irimi motion (instead of a more conservative tenkan pivot blend) is a unique part of his every day aikido. Further, his decision to enter on nearly every attack gives a lightening fast quality to his applications. See picture of Wing Chun block to the left. Watch any Seagal aikido demonstration, and it won’t be long before he employs a Lift Up Application. I think he utilizes the Lift Up Application so often because he is able to find it so easily; almost at will. In the picture to the left, you can easily compare the size of Taka Sensei’s hands to his ukes’ hands, and see why he almost can not miss on that application. An additional support for his many Lift Up Applications is possibly due to the fact that traditional aikido uses open handed striking in many of its attacks, so the uke’s fingers are nearly always available. Of course, the Lift Up is certainly one of the most common applications he employees but the Front Wrist Throw results in some pretty cool glam shots also. He uses the Front Wrist Throw mainly on attacks with knives ~ or straight punches (tuske). 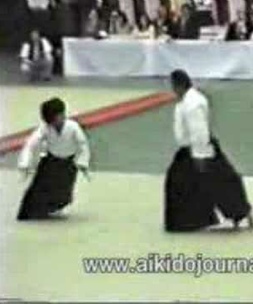 So there you have it ~~~ What makes Taka Sensei’s aikido so identifiable? 5. His essential reliance on his uke’s ability to protect themselves at all times during demonstrations of his art. One final note, there is a little thread that connects us to him. One of Taka Sensei’s most influential aikido instructors was Hiroshi Isoyama. Shihan Isoyama was a friend of Mr. Bowe’s. He taught aikido at Kuma Station in Hokkaido Japan (during the same time that Mr. Bowe was stationed there). An article about Hiroshi Isoyama Shihan, Taka Sensei’s teacher, and Mr. Bowe’s friend, is here. 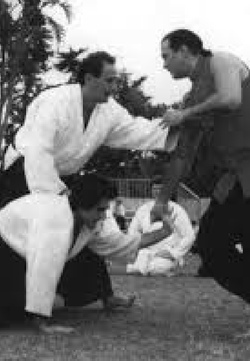 Here is link to an interview in which Seagal discusses his ideas about aikido in great detail. Is there something I’ve missed, or something you see that I’ve omitted? If so, post your comments down below! Big Hands = Easy Lift Up Applications! Combine the Wing Chun Block with a strong irimi motion and you have Taka Sensei’s signature first movement. Bolt Upright Posture, with signature forward lean, and hands down by his side. ~ That’s how Seagal does it. ~~~ Uses Steven Seagal footage to make points.